Even a minimally equipped kitchen has a set of dry measuring cups stacked in a drawer somewhere—it's difficult to follow most recipes without them. While we prefer using a scale for tasks like baking that require superior accuracy, dry measuring cups are still handy to have around. They're what you grab when a recipe calls for a quarter cup of minced onion, a cup of cooked rice, or a half cup of sugar to mix with an equal amount of water for simple syrup—situations where quantity matters, but not to an extent that it will be problematic if you're a little bit off. That doesn't mean one should take accuracy for granted when it comes to dry measuring cups, though. You may have some breathing room with that quarter cup of minced onion, but an inaccurate set can amplify what is already an inherently inaccurate method of measuring. In some cases, that can become a real issue. We evaluated 11 sets of measuring cups designed to work with dry ingredients to find ones that are accurate, durable, easy to fill, and easy to level. 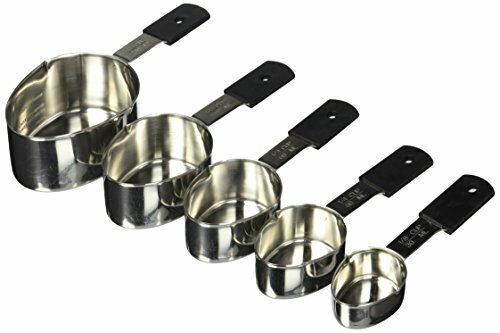 The most accurate set tested, the Norpro Grip-Ez Stainless Steel Measuring Cups have shovel-shaped bowls that dig into packed brown sugar and flour easily. The five-piece set includes a 1/8-cup measure, and the cups have welded-on handles covered in a comfortable nonslip rubber grip. The handles are aligned with the rims of the bowls for easy leveling after filling. A good measuring cup set should be two things: accurate and durable. In choosing which sets to test, we considered best-selling items from major retailers like Amazon, and cross-referenced reviews from other reputable brands, like Cook's Illustrated (subscription required) and The Sweethome. One major decision is material: plastic or stainless steel? Because steel isn't prohibitively expensive, heavy, or bulky, we decided to focus on it exclusively. More importantly, steel carries less risk of deforming when exposed to the heat of a dishwasher or a chance encounter with a hot pan. We also excluded cup sets that are bundled together with mixing bowls or measuring spoon sets (read our review of the best measuring spoon sets here), and any with a gimmicky design—like the group of handleless, nesting owl cups we saw. While some measuring cup sets offer convenient nonstandard sizes, like 1/8 or 3/4 cups, we considered 1/4-, 1/3-, 1/2-, and 1-cup measures the most essential, as you can make just about any recipe with those alone. Still, we included sets with more sizes in our testing, as long as they also had those common sizes. We started by looking at the features that make measuring cups easier to use. We awarded points to sets with cups that had flat bottoms and balanced handles, which help when you're filling the bowls from a bag or have to set a full cup down during a recipe. With most sets, the lightweight 1/4 cup tipped over instantly or with very little effort. We filled the two smallest cups in each set with honey to gauge how easily the sticky ingredient emptied out when the cup was turned over. Here, we found that a pour spout helped only a little to encourage the honey to stream out; really, a small silicone spatula is the best way to get the last few grams' worth out of each measuring cup. We noticed how well each set nested together, and if the handles, which were often less than three inches long, helped conserve drawer space. Unlike with measuring spoons, which are easy to lose if not bound together, we prefer not to keep our measuring cups bound by a ring, chain, or clasp; because cups are larger than spoons, they're too unwieldy when connected. Plus, a well-nested set of cups has no trouble staying together in a drawer. For some dry ingredients, the dip-and-sweep method is the most precise way to measure the contents of a cup. But the build of the measuring cup can have a big impact on how easy it is to swipe the contents level. If the top of the handle isn't aligned with the rim of the bowl, or if there's a bump or slope between the two, leveling the cup with a sweep method is difficult, leading to even less accurate results. Filling up a cup of brown sugar might not seem like heavy lifting, but in preliminary durability testing, scooping a cup of it was enough to bend the handles on one extra-flimsy set. That kind of poor build quality, no matter how accurate the cups are, won't last (though the set in question was also inaccurate—coincidence?). To test durability in the most accurate sets, we pitted each set's 1/2-cup measure against staled brown sugar that we had packed into a 9- by 9-inch baking pan and set out to dry overnight. We scooped up the hard sugar, packed it into each cup, and evaluated how much the handles flexed under stress. We also examined the markings on the cups, taking note of which were stamped into the material and which were printed or painted on. Generally, stamped markings are preferable, since they aren't prone to rubbing off over time the way printed ones can. A dry measuring cup is inherently inaccurate, especially when dealing with ingredients that have inconsistent densities—either because they can be easily packed and compressed, like flour and brown sugar, or because of natural variations in the product, as is the case with different types and brands of salt. Hand two cooks the same 1-cup measure, ask them to dish out a full cup of all-purpose flour, and you can end up with anywhere from four to six ounces of flour. Salt, meanwhile, is all over the place when measured by volume—a half cup of table salt and kosher salt, or even two different brands of kosher salt, will deliver wildly different amounts of sodium. That kind of variation can cause a cake to collapse and a meatball mixture to turn out woefully over-salted. In those situations, a scale is your best bet (and any recipe that doesn't recognize those situations by giving weight measurements isn't worth its, ahem, salt). But, while a measuring cup might lack precision when measuring certain ingredients, that doesn't mean it's useless. There are still many cooking tasks for which such precision isn't required. There are also plenty of ingredients that don't compress significantly, such as granulated sugar. A batch of béchamel sauce, for instance, will come together just fine even if you measure the flour by volume—any inaccuracy can be dealt with in the moment with some small adjustments on the part of the cook, thinning out the sauce with a little extra milk if it's too thick, or letting it cook down and thicken slightly if it's a hair too thin. Simple syrup, meanwhile, will suffer no ill effects if the sugar is measured by volume, since granulated sugar can't easily be compressed into a cup. Here's the important thing: Just because a measuring cup doesn't always deliver the precision of a scale doesn't mean you should be content with an inaccurate set. Measuring cups that are themselves inaccurate simply amplify the problem, potentially leading to more significant trouble. Testing accuracy, it turned out, isn't so easy. We started where most people would, seeking something to measure in the cups that has an invariable density. Water is the most obvious choice, since a milliliter of water weighs exactly 1 gram. By filling a measuring cup to the top edge with water and then weighing it, we should, in theory, be able to determine the cup's real volume. Since volumes are standardized, we could then find the measuring cups that are closest to the defined standard. The first hurdle was deciding which standard to follow, because, as it happens, there's more than one. According to the Weights and Measures Division of the National Institute of Standards and Technology (NIST), one "customary" cup is technically 237 milliliters, though NIST is willing to round that up to 240 milliliters as the official conversion for home use. The FDA, citing Code of Federal Regulations Title 21, uses the same numbers for nutrition labeling, equating 1 cup with 240 milliliters. Most kitchenware manufacturers follow suit, claiming that their 1-cup measures are equal to 240 milliliters. Still, we found one set of measuring cups that listed non-rounded-off conversions on its handles, which made us question which standard—the rounded-off one or the more exact conversion—we should use as our benchmark. In the end, we decided to go with NIST, the FDA, and the vast majority of measuring-cup manufacturers, agreeing to use the rounded-off numbers as the standard. They're far more widespread in cooking and recipe applications, and they're much easier to work with than wonky numbers like 78.5—which is what 1/3 cup would equal to without rounding up to 80ml. With that decided, we then proceeded to fill each cup with water and measure the weight of that water to determine how accurate the cup was, repeating the test a minimum of three times for each cup in a set and averaging the results. We used an eyedropper to fill the cups, stopping just when the top of the convex meniscus aligned with the bowl's rim. Pretty soon we had a list with a clear winner, plus a couple of runners-up. Then we decided to repeat the test, this time using a substance dry measuring cups are meant to measure: a dry ingredient. We chose granulated sugar, which doesn't compress easily and is easy to sweep level. A cup of granulated sugar should weigh 198 grams (7 ounces), and it should do so consistently in an accurate measuring cup. And that's when things got interesting: The measuring cups that had been in the lead with the water test—ones that had been named a winner in a competitor's tests (which, it should be noted, also used water to determine accuracy)—fell to a distant third place. Our second-place winner in the water test rose to first place in the sugar test, making it the only set of all 11 tested to do better in the sugar test than in the water test. All the others performed worse in the sugar test. Upon first inspection, it was tempting to toss out the sugar results and go with the water results instead; after all, water should be the most consistent, given that it's the invariable link that allows volumes and masses to be equated. But the numbers told us a different story—namely, that our results in the sugar test were notably precise, meaning that even over multiple rounds of scooping, sweeping, and weighing, the sugar results always landed within a gram or two of each other for any given cup. That suggested there was more at play than just an inconsistent reading of a dry ingredient. The more the Serious Eats culinary team talked about these conflicting results, the more suspicious we became of our water measurements. Water itself may be a constant in a test like this, but human error is not, and that, we decided, was the key: Dry measuring cups are designed to measure dry ingredients, not wet ones, and getting a trustworthy measurement of how much water can fill a dry measuring cup isn't easy. There's no way to do that with fluid in a dry measuring cup that's made from an opaque material like metal, and that has only one real fill marking—the rim. You can try to fill it to the top with water, eyeballing where you think the fluid is level with the rim, but you can never be certain you've filled the cup properly. There's also no way to sweep the water the way you can with sugar to better level it with the rim. Basically, with water, you're guessing at best. To confirm our suspicions about granulated sugar being a better gauge, we repeated our scoop-and-sweep tests a minimum of 10 times each with several of the most accurate cups. Indeed, the sugar continued to give us precise and consistent readings. And so with that, we threw our original winner in the junk heap, along with most of the others that were way off the mark, and crowned a new set of cups the most accurate. After running the measuring cups through the design, durability, and accuracy tests, we were able to narrow down our picks to the winner. The Norpro Grip-Ez Stainless Steel Measuring Cups took the top spot in the sugar-accuracy test, and it wasn't even close—the next-closest set in the sugar test was twice as far off the mark. The bowls are securely joined to the handles and manufactured to tight tolerances, which helps with level sweeping. Other two-piece builds we tested didn't inspire the same confidence. The unique oval cup shape comes to a narrow end, acting like a shovel to dig into compacted ingredients. For righty users, there's a small notch cut into the handle that acts as a natural rest for a pointer finger, but our left-handed tester didn't find it uncomfortable. The 1.36-millimeter-thick metal handles are dipped in rubber for a comfy, nonslip grip, though the coating doesn't perfectly seal to the handle, which raises some concern about gunk and grime building up in the pocket over time. The largest, 1-cup measure has stamped markings on the inside of the bowl for 1/8-, 1/4-, 1/3-, and 1/2-cup quantities. This will never be useful for any kind of even remotely accurate measuring, but could be handy if you need a rough amount—something like a half cup of minced parsley—and the other measuring cups are dirty. None of the four primary cups tipped over when empty, though the small, 1/8-cup measure did. Each handle is stamped with the amount in both cups and milliliters, rounded to the nearest 10 following the NIST and FDA standards for food and nutrition labeling. One downside to two-piece measuring cups: The seam where the scoop meets the handle gunks up with sugar, flour, and water.